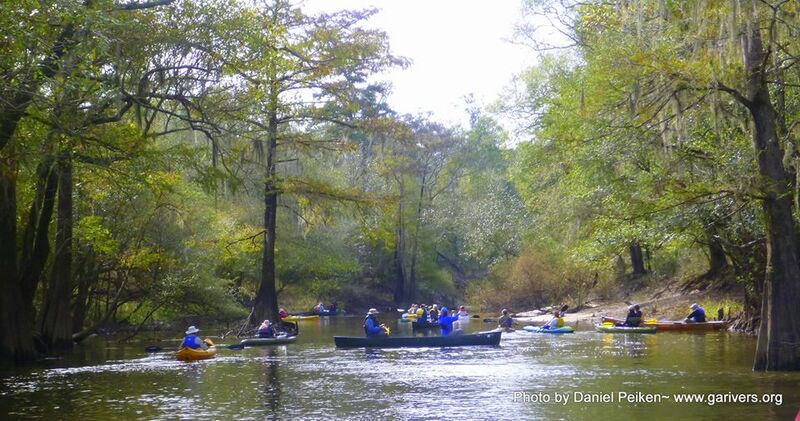 Ochlockonee River Water Trail, Golden Triangle Resource, Conservation & Development and Birdsong Nature Center partnered with the Georgia River Network to host the first ever local paddle event making the Ochlockonee River Hidden Gem Paddle on November 14, 2015 a GREAT SUCCESS! Nearly 70 participants, presenters and volunteers joined in to experience, learn about, and celebrate this beautiful up-and-coming Water Trail. Paddlers came from as far north as North Carolina and from northwest Florida to the south. The youngest participants ranged from 5 months to fifteen years and the oldest being in their 70s. It truly was a diverse and energetic group. The morning began with donuts from Syrup City Donuts, coffee from Grassroots Coffee and welcome bags complete with magazines from the Cairo/Grady and Thomasville Chambers of Commerce. There were peanuts provided by the Georgia Peanut Commission and paddle whistles donated by Keep Grady County Beautiful. KGCB also donated porta-pottys for the event. Other brochures provided information on Georgia River Network, Golden Triangle RC & D, Tall Timbers and Ochlockonee River Water Trail. A number of businesses donated pens, bookmarks and gum. A full list of sponsors is included on our ORWT website. A special thanks to Southern Insurance, Ameris Bank, GRACO Fertilizer, Tall Timbers, Claire and Bill Matturro, Chastain Bicycle Shop and the Plaza Restaurant. The put-in location was Hadley Ferry Landing. Boaters arrived and were assisted by a number of volunteers to include Cairo High School’s FFA students. They were present throughout the day and assisted with canoe and kayak transport, even when we came ashore at the Dickey Ferry Landing four miles south. It was agreed with the students, a future paddle will be planned to celebrate their help and to experience the Ochlockonee first hand. There were a number of volunteers and donations from the community that made the day a success to include the Sheriff’s Office, the Road Department, Stalling Motors, Cairo High School Transportation, Wayne Redden, Courtney Morrison, Ruthie Pfaff, Jennie Wood, Yvonne Stinson and others. A BIG thank you goes to locals and GRN volunteers who gave of their time to ensure the paddle was safe and enjoyable. Boo and Seth Stanaland, Cheryl Mills, Vicky Redden, Dessa Dunn, Phillip Hodges, Daniel Peiken, Alan and Ellen Coats, Amanda Lanphere and Natalie Barfield; your help was invaluable. The paddle was christened by one of Cairo’s own, local musician Gary Asbell. He had written songs about the Ochlockonee River and serenaded the group on a bluff below Hadley Ferry. Paddlers were mesmerized as he played his guitar and harmonica while they passed by. Presentations were a part of the educational component of the paddle. Speakers included Rhonda Gordon- Golden Triangle RC & D, Celeste Tyler- Keep Grady County Beautiful, Julie Shutters- Golden Triangle RC & D, Margaret Tyson- Ochlockonee River Water Trail, Gwyneth Moody- Georgia River Network, Christine Ambrose- Thomas University, Beth Grant- Wolf Creek Trout Lily Preserve and Lost Creek Forest, and Brad Alexander- Department of Natural Resources. The focus was our river- cleanups, water quality monitoring, local cultural history, conservation efforts, partnering with community organizations, native/invasive plant species and wildlife. Brave paddlers from the American Native Fishes Association, Michael Wolfe and Camm Swift, had no problem wading up to their elbows into the chilly river water to sein a plethora of fishes and even freshwater shrimp. Majestic Bald Cypress, Ogeechee Lime and Weeping Willow graced the river banks at every turn, and at times reaching out and making the river a paddling obstacle course. Paddlers lucked out with beautiful weather and a lovely water level, and we couldn’t have asked for a more supportive group of friendly enthusiastic paddlers. Lunch was provided by north Georgia’s Len Foote Hike Inn and was held on the banks of Deerwood Plantation. Poetry written by our Raymond Stokes was read by paddlers with a focus on the river, changing seasons and a country way of life that many cherish. It was a magical time on the Ochlockonee. The finale to this first paddle was a catered dinner at Birdsong Nature Center. The meal was catered by Michael Shutters, a chef and DNR employee at the Seminole State Park. There was a silent auction, lively conversation and corn-hole games. The new moon welcomed shooting stars for those who chose to camp on the grounds. Three important community partners included UGA Archway, Thomas University and Birdsong Nature Center. 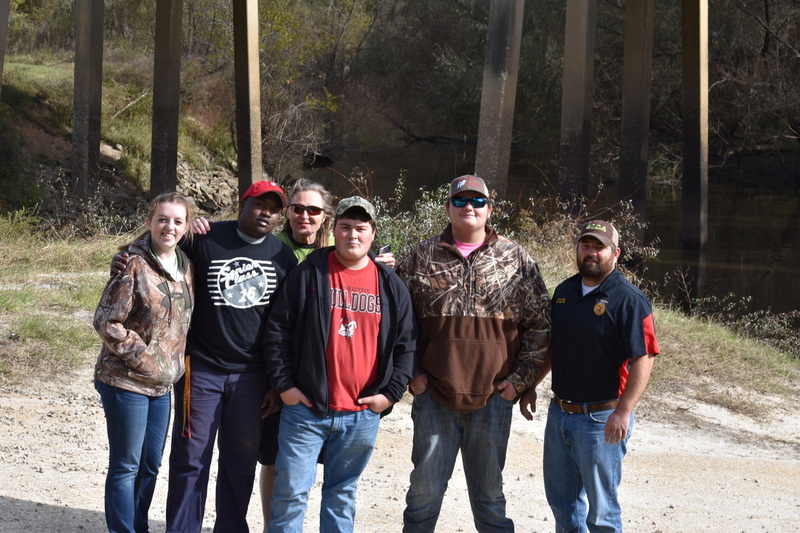 Ochlockonee River Water Trail is excited to be working with Betsy McGriff and UGA students in environmental design and public relations to further the goals of ORWT. A conceptual drawing for the Hadley Ferry landing is available on both the ORWT and Grady County websites. Thomas University students, under the direction of Dr. Christine Ambrose, have developed a baseline study of the possible access points along the river and created maps that were used in the development of the Hidden Gem Paddle. The relationship with Kathleen Brady and Birdsong Nature Center is a natural fit in that the water trail and center are near in location and have similar goals of conservation and increasing awareness of our outdoor natural resources. These partnerships are critical to our success and an example of the power of community partners.